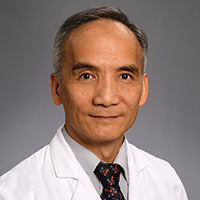 Tony Y. Eng, MD, is Professor in the Department of Radiation Oncology at Emory University School of Medicine in Atlanta, Georgia. A board certified radiation oncologist, Dr. Eng practices general radiation oncology and specializes in the treatment of gynecologic, pediatric and prostate cancers. He practices at Winship Cancer Institute of Emory University and Emory Saint Joseph's Hospital. Prior to arriving at Emory, Prior to joining Emory in 2017, Dr. Eng served as Chief of Radiation Services at Fitzsimons Army Medical Center. After completing his military obligations, he joined the University of Texas Health Science Center in San Antonio and was appointed as Residency Program Director. He was then appointed as Medical Director and Vice Chair of the department. During his 18-year tenure at University of Texas, he obtained NRG (formerly Radiation Therapy Oncology Group RTOG) affiliation for the department. Dr. Eng was an institutional principal investigator with NRG Oncology where he has led on several successful clinical trials at the University of Texas. He also initiated and strengthened the gynecologic and prostate LDR and HDR brachytherapy program and expanded the pediatric oncology services. Dr. Eng completed medical school at F. Edward Hébert School of Medicine in Bethesda, Maryland. He completed his medical internship at Brooke Army Medical Center in San Antonio, Texas, and his Radiation Oncology Residency at University of California in San Francisco. Dr. Eng is a principal investigator with NRG Oncology (formerly Radiation Therapy Oncology Group or RTOG) where he has led on several successful clinical trials. Dr. Eng has received the following awards and honors among others: Teacher of the Year Awards, San Antonio Top Doctors, Educator of the Year Award, Association of Residents in Radiation Oncology, Outstanding Physician, Health Care Heroes, San Antonio Business Journal, Castle Connolly's Top Doctors, Texas Rising Stars (Super Doctors), Texas Monthly, Presidential Clinical Excellence Award, University of Texas Health Science Center at San Antonio, Compassionate Doctor Recognition and Patients' Choice Awards, Vitals.